Whilst great oral healthcare can be achieved with a manual toothbrush and normal floss, there are many benefits from an electric toothbrush and a water flosser. The WP-900 is for all intents and purpose is a bundle of these 2 products. Although it is a totally new product, if you were to compare it is like buying the Waterpik Ultra water flosser and the Waterpik Sensonic Professional Plus electric toothbrush (SR-3000) which have a combined retail price of $150. The WP-900 has a price of $100 or less. A $50 saving for combining 2 products into one, without any loss of benefits. It is a superior package that helps you achieve great teeth and gums without a budget busting price tag. Read on for our detailed Waterpik Complete Care WP-900 review, or see our best Waterpik article for more buying advice. There are a few different models that fall under the Waterpik Complete Care brand, but in this post we’re reviewing the WP-900. The others are the Complete Care 5.0, 5.5, 7.0 and 9.0. Below we have included a price comparison of retailers that stock the WP-900, and it’s always worth checking out eBay. Here are a list of the pro’s and cons having used the Waterpik Complete Care Water Flosser and Sonic Toothbrush, WP-900. Large water tank – Floss for longer or multiple times between sessions thanks to a 700ml tank. Pressure settings – 10 pressure settings to choose from. Box contents – Nice number of tips included. Tip storage – A lid to the unit acts as storage for the different tips. Sonic toothbrush – Strong performing brush with 2 cleaning modes and a weeks battery life. Price – Great value for money. Size – A bit chunky. Takes up work surface space which might be limited for some. In the box with the WP-900 comes documentation that explains how to use it. The following is an explanation as to how to use the water flossing part of this package as most know how to use the toothbrush. Step 2: Fit the appropriate nozzle to the handle of the flosser ensuring it has clipped into place. Step 3: Adjust the pressure dial on the unit to your desired pressure level (can be adjusted later). If it’s your first time using, turn down to a lower setting. Step 4: Lean over the sink and place the tip of the flosser into your mouth. Close the lips enough to prevent splashing while still allowing water to flow from mouth into the sink. Step 5: Turn the power button on the main unit to the right to switch the unit on. Step 6: Aim water at the gumline at a 90 degree angle. Follow the gumline and pause briefly between teeth. Step 7: Turn the power button on the main unit to the left to switch the unit off. During the clean you can adjust the pressure, turn the nozzle and control water flow. Turn the dial on the main unit to adjust pressure. Press and holding the Blue button on the handle to pause the water flow. Twist the top of the flosser handle to rotate the tip for finer control. Here is a video to show you how it is done. As you might expect, out of the box, this unit is of a reasonable size and you will need some space on your bathroom countertop or shelf to accommodate this. It is a bit clinical looking, it would look right at home in a dental practice, but the White and Blue color scheme is fairly inoffensive and will look ok in most homes. It certainly isn’t as stylish as the Sonicare DiamondClean products. As this is 2 products rolled into 1, I will first begin talking about the toothbrush. For me, the toothbrush has a very practical look and feel to it. It does look a little dated, but it works pretty well, so I can’t knock it. This sits in the upper third of the handle, whilst in the lower third is the battery status/charge icon. Inside the brush handle is a Nickel Metal Hydride (NiMH) battery, that offers up on average a life of 7 days between charges. That is based on 1 user, cleaning twice a day for 2 minutes each time. Essnetially 28 minutes of continuous running time. The front mounted LED’s give the feedback on the battery charge. Sit the brush back on the dock and ensure the power supply is connected to the unit for charging. On the sides of the brush handle, wrapping in a slightly wavy formation to the front and rear is a piece of Blue rubber, this acts as a grip and keeps the brush firmly in hand. The parts of the hande both front and rear that are not covered in grip are a smooth touch plastic that is White in color. At the top of the brush is the brush head. In the box comes 2 different heads, a standard and compact. It is a case of picking which head is your preference. Most will opt for the standard head, but the compact one can be useful for children, young adults or if you feel more comfortable brushing with it. Roughly the size of a manual toothbrush head, they are not small and round like Oral-B heads. They are interchangeable though, just swap them when desired.. Heads should be replaced every 3 months and can be purchased in packs of 3 as and when you need them. The Sonic cleaning action delivered by the brush is actually pretty good and was better than I had expected and I cannot fault the cleaning experience. When you power the brush on, it actually launches into 1 of 2 cleaning modes available on the brush. That first mode is the slower, but press it again and the high speed mode will be activated and deliver a full 30,500 movements to the brush head. As the brush is powered on a 2 minute timer will kick in. This is designed to help you brush for the right amount of time, the time dentists recommend. In addition the Sensonic Professional Plus also activates the 30 second pacer. As 30 second intervals, the brush will create a short pause in the cleaning action to remind you to move to the next quadrant of your mouth. At the end of the 2 minutes, the brush will automatically turn off. As far as essential features go, this brush has all those tick boxes covered and I am pretty impressed. It would be nice to have a pressure sensor, that would alert you when you are applying too much force, but I am bit a bit picky here. In addition to the core brush features, a hard plastic travel case is included. This will hold the brush handle and up to 2 brush heads, protecting them from damage when in transit and stopping accidental activation. Back to the flossing element of the unit then. Wired into the base of the unit is a power cable that is compatible with 120VAC/60Hz outlets, for use In North America. Power is needed each time you want to use the flosser, it does not have a battery built in. That power is needed if you want to recharge the toothbrush, but it does not need always be connected to power. A combined unit like this saves taking up 2 separate sockets in the bathroom as would be the case if you purchased the electric toothbrush and flosser separately. The base of the flosser contains the pump that pulls the water from the user removable tank that sits above it. The tank has a capacity of 23oz/700ml, which gives 90 seconds or so of flossing time. On top of the tank is a lid, that stops anything, notably dust and debris falling into the water in the tank. Whilst the tank takes up about ⅔ of the unit, to the left hand side the remaining ⅓ is taken up with a unit that the tips can be stored in. This is handy as it keeps them all in one place and within easy reach. On the front of the unit is a power and pressure dial. The power dial sits on top and is the smaller of the 2. Both are a pale Blue in color. 1 click to the right turns the unit on, whilst a click back to the left wll turn the unit off. The pressure dial has 10 pressure settings that vary from 10 to 100 PSI. Move the dial, left or right to find the pressure that is most appropriate for you. I typically found the more powerful side of the scale 7 or 8 was my preference. Sitting slightly proud to the right of the unit, is the flosser handle, with a length of coiled cable neatly stowed away in the body of the WP-900. Just pull the hose out to extend the reach. When extended the hose and handle combined has a length of about 3 feet. This allows a little distance between the unit and the sink you use it over. The elliptical design of the handle fits comfortably in the hand and the large, pale Blue button on the front is the key to controlling the water flow. From the moment the power button is flicked to the on position this thing is spouting out water. Press and hold the Blue button on the handle to stop the flow and then release to allow it to restart. The tip can be rotated a full 360 degrees thanks to the top of the handle rotating. Ridges around the top make it easy to grip onto to rotate, although it is not all that easy mid floss in my opinion, it can be a bit fiddly. It seems too much hassle to turn the unit off and adjust, so you need to press the pause button and do it. The length of the tips and the varying angle of attack, certainly meant that I could reach more areas of the mouth more easily than with traditional floss. The clean felt more invigorating thanks to the adjustable pressure settings. Waterpik manufacture 6 different styles of tips. Classic Jet Tip (JT-100E) – For general use offering twice as effective results than string. Toothbrush Tip (TB-100E) – For brushing and flossing at the same time. Plaque Seeker Tip (PS-100E) – Ideal for those with implants, crowns, bridges or veneers targeting plaque in hard to reach areas. Orthodontic Tip (OD-100E) – Great for those with braces offering up to 3 times more effectiveness than traditional floss. Pik Pocket Tip (PP-100E) – Delivering medicament and rinsing deep below the gumline those with periodontal pockets and fucations benefit most here. Tongue Cleaner Tip (TC-100E) – Freshens the breath by removing bacteria from the tongue’s surface. The WP-900 comes with 5 tips in total, 4 of which are different styles. The toothbrush tip, for obvious reasons is not included. Nor is the Tongue cleaner. The different tips clip into place on top of the handle of the flosser. A button on the rear needs to be pressed to unclip/eject each of the different tips. The number of tips provided and the storage unit, make it ideal to share this flosser with other users in the same house, just change the tip each time. Tips, like a toothbrush need changing every so often. If using the Classic Jet Tip, this can be used for up to 6 months before requiring replacement, whilst all others should be replaced after 3 months use. Once the desired tip is connected and the tank filled you can begin flossing. When you fill the tank, the idea is you fill it with water, this can be cold or lukewarm if you prefer. The advised is the warm water. You could add a dash of mouthwash too if you wanted an extra burst of freshness. If you have never used a water flosser before, you will likely make a mess the first few times you use it. It takes a bit of practice to get used to how this works. Don’t worry you are not alone here. When running the machine does produce quite a bit of noise due to the pump inside. It is a bit noisier than an electric toothbrush. If you tend to floss in the middle of the night, make sure you shut the bathroom door to block the sound. A full tank which holds 23oz will allow for about 90 seconds of flossing time. Once you have perfected your approach, you can get 2 flossing sessions from a full tank, 45 seconds each. For the first few weeks you may need to refill and play around until you find your groove. Sadly, unlike some models there are no timers or pacers to help you floss evenly, you need to perfect that technique yourself, not a big issue, but it would be nice to have this. Whether your choice for interdental cleaning is dental floss, interdental brushes or a water flossing. Failing to clean properly between the teeth and gums can lead to a buildup of bacteria and plaque that in turn can result in gum disease. The pressure and flow of water that this flosser offers, reaches bacteria deep between teeth and below the gumline where brushing and traditional flossing can’t always reach. The flow of water does too massage and stimulate the gums to improve circulation and keep your gums strong and healthy. Waterpik have ensured that their products are backed up by clinical evidence. They have plenty on their clinical research page but one in particular stands of for me. A study by Guror in 2009 found just a 3 second treatment can remove 99.9% of plaque biofilm. 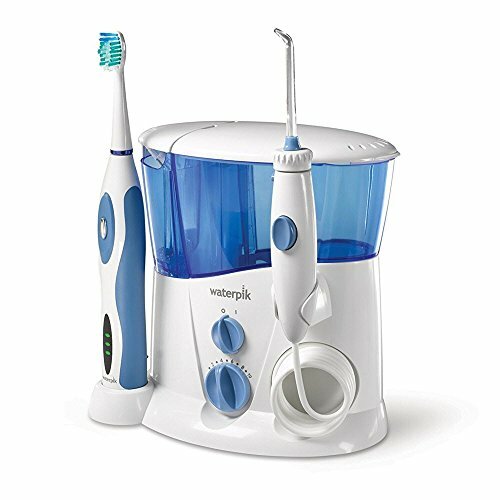 The Waterpik Complete Care provides an all round package that takes care of your toothbrushing and interdental cleaning needs. There is certainly a convenience and ease that water flossing offers in comparison to string floss. The fingers and thumb approach can feel more awkward, harsh and just a hassle. What might appear a complex and expensive package, it really is not. Aside from buying separate items few alternatives to this setup exist. Hard plastic travel case for protection of brush and heads in transit. There has to be some sort of cost saving for rolling 2 products into 1, but sometimes you can also pay extra for this convenience. Thankfully a saving is what you get here. If you looked exclusively at Waterpik products, the flosser and toothbrush would have a combined cost of $150. The SR-3000 toothbrush costs $90 and the the Ultra water flosser $60. Other brands such as Sonicare and Oral-B do not produce an equivalent water flosser, but it is fair to say that an equivalent brush to the Sensonic Professional Plus, would cost anywhere between $40-80. Waterpik’s toothbrush is perhaps a fraction overpriced given the competition. The suggested retail price for the WP-900 Complete Care solution is $99.99. That is at least a $50 saving. That is a win in my book. However, things get a little better as this can be purchased for just under $80. Of course prices are subject to change, but there is the potential for another $20 of saving there. We’ve listed a live price comparison for the WP-900 here. A typical calculation that we like to do is price the product over 3 years to work out an approximate ownership cost. This is a little trickier than normal, because we are talking about a solution that rolls 2 products into 1, but, it is still worth doing. To do this, consideration needs to be made for replacement brush heads and tips for the flosser. Over the course of 3 years of ownership, presuming you used just the Classic Jet tip, you would need to buy 4 of these, in addition to those that came in the box. At $10 for a pack of 2, they work out at $5 each. When it comes to brush heads, most will use the standard sized brush head. A pack of 3 costs $15-20, so lets say $6.50 each. Over 3 years, 12 will be required. 1 comes supplied in the box. Therefore take the $100 purchase price, add the $20 for jet tips and $71.50 for the brush heads and you have a total cost of $191.50 or $0.17 per day. Pick the unit up for the $80 and there is a further $20 of savings to be had. The cost then drops to $171.50 or $0.16 per day. Whilst it is of course subject to change as a rough guide an electric toothbrush will cost about 10-12 cents per day, whilst the flosser 6-8. This means a daily cost of somewhere between 16 and 20 cents. Therefore all things considered there is some slight savings to be had by buying this all in one package, not taking into account the consideration of convenience cost. When we test products here at Electric Teeth we try to look for possible issues that may occur during years of ownership and use our experience to look for possible signs of weakness. We do not perform any stress or durability testing. From our hands on time with this unit there are no major concerns. It is possible over extended periods of use, the battery in the toothbrush handle can fail from repeated charging and the hose between the flosser and the handle can become brittle with repeated stretch and coiling. The chances of you experiencing this are slim. If you were to take any preventative measures, it would be to disconnect the unit form the power when not in use, or take the brush off the charging stand, so it is not always being replenished. Peace of mind comes in the form of the 24 month (2 year warranty) that Waterpik offer. This means that should something go wrong. Providing it is not as a result of user damage, it should be covered under warranty and be repaired or replaced free of charge. The WP-900 Complete Care is a pretty fantastic solution. Whilst there is room for improvement, I am splitting hairs and what you get here is quite simply brilliant for the price. Waterpik have pretty much delivered all you could want and ask for, including a travel case for the toothbrush. A large tank on the water flosser gives plenty of flossing time, even multiple flossing sessions between refills. A number of tips are included and there is space to store them too. The toothbrush brush performs well with different speed settings, built in timer and pacer. It gives the likes of Sonicare and Oral-B a run for their money. If you like the idea of the benefits this brings and the convenience of just 1 purchase, then you should just go out and get this. This is the size of the main unit. How long does the battery in the toothbrush last? It will last approximately 7 days based on 2 cleans per day of 2 minutes in length. Approx 23oz/700 ml which will last for approximately 90 seconds. Do you own or have you used the Waterpik Complete Care unit? THANKYOU FOR THE MOST COMPREHENSIVE REVIEW. YOUR REVIEW IS MUCH MORE INFORMATIVE THAN ANY OTHER (OF THE 12 OR 13) REVIEWS I READ.